So, thirty years: was it worth the wait? You betcha. Hit ‘play’, close your eyes, and revel in the halcyon days of the NWOBHM as the title track’s opening riff and drum pattern evoke memories of the greatest period of British metal. Yes, lyrically ‘Heavy Metal Sanctuary’ as a whole romps through the A – Z of metal clichés but who cares? This is about atmosphere, and passion, and if the music sounds Eighties then the production is as contemporary as it comes, giving each cut more swagger and punch than a night out on the town. 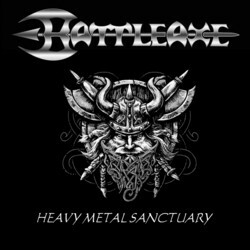 The album also muscles in on Teutonic territory at times, with the likes of ‘Give It More’ and ‘A Prelude To Battle’/’The Legions Unite’ in particular beating their chests and squaring up like Accept on steroids. Time and time again guitarist Mick Percy (who’d joined the band after that original pair of albums had been released) and drummer Paul AT Kinson prove themselves to be more than just along for the ride and King’s metal tonsils are in fine form across the board. I’d actually expected to file ‘Heavy Metal Sanctuary’ under ‘quite interesting’ but instead it’s ended up in the ‘essential purchase’ folder. Buy or die, as they used to say back in the Eighties.